How long should our stopover be? Should we go it alone or find a tour operator? If we use a tour operator, who should we choose? What exactly should we visit? Did we need a visa? Can we apply for it on-line? What clothes will we need? What medication should we take? I have written 9 posts detailing our trip (see below) which we thoroughly enjoyed but I thought it might be useful to answer the above questions in a 10th post. How long should you spend in the Golden Triangle? We had a 24-hour stopover on the way to Australia during which we spent an afternoon visiting Old Delhi, spent the night in Delhi and left for the airport next morning. On the return journey, we had a 5-night stopover. We arrived late afternoon, spent the night in Delhi, visited New Delhi in the morning, then spent two nights in Jaipur and one in Agra (next to the Taj Mahal) visiting the major sites in what is known as the Golden Triangle. We spent the last night in Delhi again before heading back to Paris next morning. We couldn’t understand initially why it would take us 5 ½ hours to drive 270 km to Jaipur, 6 hours to drive 245 km from Jaipur to Agra and 4 hours to cover the 205 km from Agra to Delhi, but the answer is simple: despite the fact that there are motorways, the going is slow from Delhi to Jaipur to Agra because you share the road with vehicles of every shape and size, both motorized and unmotorized, not to mention the cows, donkeys and pedestrians who wander across the road whenever there is a village. The stretch from Agra to Delhi is shorter because there is a real motorway with no animals or pedestrians on it. We found that the length of time we had chosen was perfect. We didn’t have to hurry everywhere and we had time to rest at the end of the day. The only thing we didn’t do is shop (we’re not shoppers) but there were plenty of occasions (and time) to do so had we wanted. WARNING: THE TAJ MAHAL IS NOT OPEN ON FRIDAYS so you should schedule your visit accordingly, preferably avoiding the weekend there as well. Should you go it alone or find a tour operator? We had been told by several people that we should have a private organized tour. Considering our age (early sixties) and the fact that we do not like travelling in groups, the choice was between going it alone or finding a private organized tour. I had been to India before on my own for professional reasons and did not want the hassle of looking for hotels, restaurants and trains and finding our way about in general. Having seen the traffic in India, I did not even consider hiring a car. Our choice of a private tour turned out to be excellent. How do you find a tour operator? We went onto Trip Advisor and I sent off requests to the three organizations at the top of the list, explaining what I wanted which included French guides for Jean Michel. I received a very friendly reply from Trinetra Tours with a suggested itinerary and price. I adjusted the itinerary to our needs and schedule and Trinetra sent us a new proposal. We had several exchanges during which my various questions were answered and our visas were processed. We then transferred half the amount to their account in India. We paid the balance on our arrival. We were very satisfied with Trinetra both before and during the trip. We were assigned a general coordinator who met us at the airport and took us to our hotel in a car with an assigned driver who was very friendly and whose English, although not excellent, was more than adequate for us to communicate. The guide joined us at the hotel and stayed with us for the rest of the day. The driver would stop just outside the place we were to visit and pick us up afterwards after receiving a call from the guide on his cellphone. During the visit of the Golden Triangle, a local coordinator met us at each hotel and a new guide would join us when we reached each destination. We had the same delightful Himalayan driver, Rajender Negi, from beginning to end. 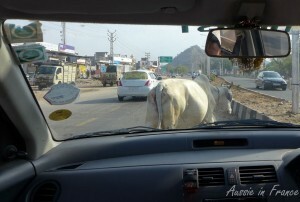 He was extremely competent and I was never afraid in the Indian traffic. He was also very willing to share his vision of India with us and asked many questions about France and Australia. The guide or the driver would choose our lunch venue which was not included in the price. Neither was the evening meal but there was always a restaurant at the hotel. We personally only had fruit at night time and something from the mini bar in our room. The guide looked after buying tickets to the different monuments and we reimbursed him. He organized our elephant and rickshaw ride. He kept the beggars away and generally made our visit stress-free and enjoyable. We were not fully satisfied with the first guide in Delhi so asked for a different one on our return. He was much better. We also did not like the guide who took us to Fatehpur Sikri so asked for another guide for the Taj Mahal next day. He was replaced and the new guide was excellent. All the guides spoke good French and were knowledgeable. Our guide in Jaipur was outstanding. I do not think that there would have been a problem with an English-speaking guide but we had specifically asked for a French guide and Trinetra did not have much experience in this field. The fact that we were able to phone and ask for another guide and that our request was immediately met is an important point in their favour. The general coordinator accompanied us to the airport on both occasions and helped us with the formalities. Bottled water was provided throughout the trip. We opted for the hotels proposed in the initial itinerary provided by Trinetra but we could have chosen a higher category had we wished to do so (obviously with a price supplement). The hotel in New Delhi, Justa Residence Greater Kalesh, was not marvelous but it was clean and spacious and the beds were comfortable. The oversights on the first stopover were remedied on the second trip and we were even upgraded to a suite the third time. The breakfast was very good and the staff were friendly. It was just a little “worn out”. 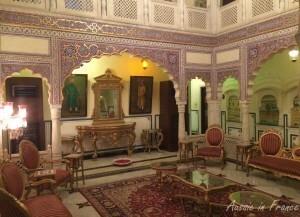 The hotel in Jaipur, Shahpura House, was really beautiful and we wouldn’t have missed it for anything. The Radisson Blue in Agra was well located, well-appointed and impersonal. The breakfast was outstanding. What exactly should you visit? Jamma Mosque, Chandni Chowk, Raj Ghat, a cycle rickshaw ride through the bazaar and Akshardham Temple (not on the itinerary but we were very impressed by it). Humayun’s Tomb, Qutub Minar, the Embassy area, government buildings, India Gate and Connaught Place. Amber Fort and an elephant ride, Shiromani Temple, Palace of the Winds, City Palace, The Observatory and Govind Dev Ji temple. The Moonlight Garden (which is closed at night! ), the Taj Mahal at sunrise, Agra Fort and the Baby Taj (not on the initial itinerary but worth a visit). Do you need a visa? Can you do apply for it on-line? For some obscure reason, you need to get an Indian visa before you go to India even for a one-night stopover and you can only apply during the month preceding your visit. You also need a square passport photo. Each country has a website that you have to apply through. You can’t apply directly to the consulate. We found the whole visa experience quite stressful because I have two passports and we were entering India twice at an interval of less than 45 days. In the end, it all worked out but we had to go to Paris to put in our applications. I suggest you read my post and apply on-line immediately after the one-month interval starts. The information on the website is not necessarily up-to-date. I was worried about the modesty issue. In fact, there are no requirements for Hindu temples or for the Taj Mahal apart from normal decency. However, at the Jamma Mosque in New Delhi both men and women of European origin are obliged to wear a wrap-around skirt or a sort of hairdresser’s cape and remove their shoes. At the Taj Mahal, the ticket includes “overshoes”. At the Fatehpur Sikri mosque, women must wear long skirts. The best solution is to take a light wrap-around skirt in your bag and use it if necessary. Our first visit was mid-February. It was warm in Delhi but not overwhelming and cooler in the morning. Our second visit was mid-March. We were very hot in the middle of the day especially in Jaipur and Agra. I only needed a long-sleeved shirt for our 6.30 am visit to the Taj Mahal. A hat is a must. What medication should you take? We asked our doctor for diarrhea tablets and antibiotics before we left. We did not take probiotics either before or during our trip. We always drank bottled water and cleaned our teeth with boiled water (all the hotels had electric jugs). We were strict vegetarians during our stay as we had been told that we were more likely to get sick from eating meat and chicken in particular. We always had curds or plain yoghurt at the end of the meal, which I had learnt to do on my previous trip to India. We only drank tea with water we had boiled ourselves. We didn’t have any digestive problems whatsoever. Although we would have liked more “authentic” restaurants, we decided to accept the ones proposed by our guides and driver rather than run the risk of being sick. The tourist restaurants serve Indian food that is usually not too spicy and is especially prepared for Europeans. It is very reasonably priced (around 1200 rupees – 16 euro – for the two of us, including water) and the toilets are usually clean. You should always have your own tissues though. We paid a total of 82,800 rupees for two people (1130 euro at the exchange rate in February 2016), broken down into 13 000 rupees for the first stay in Delhi and 69,800 rupees for the Golden Triangle. It included accommodation on a double occupancy basis, a buffet breakfast, the rickshaw ride in Delhi and the elephant ride in Jaipur, all journeys in an air-conditioned car, bottled water during the day, local guides and dinner in an Indian home on the last evening which we decided to forego due to the distance we would have had to travel. Tipping is a way of life in India and we were very pleased that Trinetra gave us guidelines on how much to tip the coordinators, drivers, guides, bellboys, etc. It made it much easier. I hope these tips will help you to organize you visit to India. You’ll find more details in the posts below and I’ll be happy to answer any questions in the comments section. 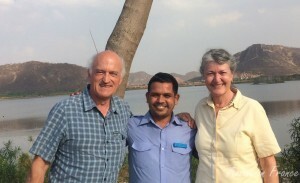 Many thanks to Trinetra Tours for making our stay so enjoyable: http://www.trinetratoursindia.com; tours@trinetratoursindia.com. This entry was posted in Accommodation, India, Restaurants, Sightseeing, Travelling and tagged golden triangle in India, trinetra tours. Bookmark the permalink. May I add? You’re more likely to get sick in a European than in an ‘authentic’ restaurant, where anyway you pay a lot more for an inferior meal. All the meat you can eat is available very reasonably in Delhi at Pind Balluchi or the United Coffee House or Karim’s, just to mention a few examples, and with a minimum of common sense humbler places are certainly not to be scorned. The road between Delhi and Agra is indeed pretty gruesome, but the new freeway will do it in couple of hours – because the toll fees are high enough to deter 95 per cent of road users and eliminates all those enormous lorries etc. It’s worth taking more time between Agra and Jaipur, there are a lot of interesting and quiet places just off the main road which most tourists miss. The best-known ‘sights’ in both cities tend to be disagreeably crowded, predictably, but Akbar’s tomb at Sikandra, just out of Agra, and Gaitor and Galta-Ji on the outskirts of Jaipur are very beautiful and calm. From the other side of the river and from the Red Fort the Taj may be enjoyed as the vision it was always intended to be, I’ve never myself wanted to go closer. A guide is hardly necessary for those who can do their own homework, but a good driver is for the simple reason that it’s much easier and more comfortable than battling it out under your own steam, often frustratingly, on trains and buses. No foreigner in his right mind, as you say, would think of driving himself. Unbelievably, there are tourists who manage to do the whole Golden Triangle in a single (very long) day, though surely not with any enjoyment. Hi Stephen, and thank you for your input. I hope other readers will be able to have a more authentic food experience with your tips. I’m sorry we didn’t know about Akbar’s tomb at Sikandra and Gaitor and Galta-Ji in Jaipur. Doing the whole Golden Triangle in a single day sounds absolutely exhausting. Also it must mean that they can only visit the Taj Mahal during the hottest hours of the day! I would always rather see fewer sights but be able to appreciate them. They go from Delhi at about 4 in the morning and so catch the Taj for about five minutes as soon as it opens. The only purpose, so I believe, is to have themselves photographed grinning in front of it. 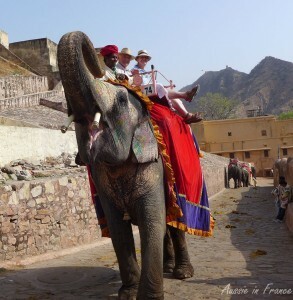 Then on to be whizzed around Jaipur and returned to Delhi at about midnight for a departure next morning. Can you think of anything less agreeable? It takes years to see, much more to understand, India and you’re right, the best way to do that is to make the best of whatever turns up – there’s something at every turn. It seems your trip to India was a success, Rosemary. I’m glad for you. I’m still not convinced to go there, although I’m sure there is a lot to see and do. But in case I’ll change my mind, your post is an excellent starting point. We would definitely hire a private tour operator, like you did. I think it’s worth it. I understand mid-February is the best time to visit weather wise. As for the sites, I’d love to see and photograph the Taj Mahal. The trip doesn’t seem to be so expensive. Thanks for the tips. Taj Mahal its a great symbol of love. I live in Pakistan, always wanted to visit this place. Thanks for the share. Interesting post. I went on the same trip a year ago, to just about the same places on the same circle (or triangle). I had booked with a Norwegian agency fixing all flights and everything, but I might as well have found a local operator like you did. That quite often turns out to be a bit cheaper, as well as giving you the opportunity of greater flexibility. Sandalsand recently posted…A disintegrated Europe – what would it look like? We never go through agencies but always book flights, hotels and tours (very rare) ourselves.